We Love a Good Adoption Story! Don’t You? One of our favorite classic tales of adoption might also be one of your favorites. ANNIE, which made its stage premiere back in 1976, went on to be a Broadway hit the following year, with a movie version following soon after in 1982. Now, all these years later, the inspiring adoption tale is back with a twist. In the new version, little orphan Annie is now a foster child, but one important thing remains the same: Sandy, the adorable homeless dog who stars alongside Annie, is adopted by Annie in all versions! You’ve got to just love that! 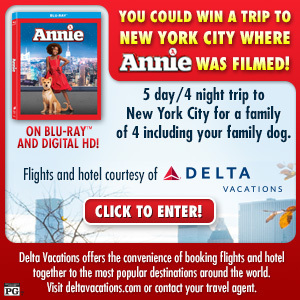 For more on the Blu-ray™ release of the film or to enter to win a trip (with your dog!) to NYC where ANNIE was filmed, visit www.Annie-Movie.com.